Head-up-display (HUD) was first featured in luxury and high-end vehicles, now the use of HUD is becoming a growing standard. Rapid advancement and development of navigation and infotainment systems, with the growing concept of connected cars have driven the HUDs to take significant position in automobile designs. HUDs in vehicles have been able to enhance the overall driving experience by providing more information to driver and eliminate the chaos of switches and knobs. Moreover, the rapid growth in electric vehicles and their need for diagnostic displays has further fueled the demand for HUDs in electric automobiles. Goldstein Research analyst forecast the global automotive HUD market to grow at a CAGR of 22.2% during the period 2016-2024. Further, the global automotive HUD market is predicted to reach USD 3.2 billion by the end of forecast period. The report covers the present ground scenario and the future growth prospects of the global automotive HUD market for 2016-2024 along with the total revenue and unit sales of automotive HUDs in every region. We calculated the market size and revenue share on the basis of revenue generated from the each segments by major players in automotive HUD manufacturing and distribution across the globe. Automotive HUD Market Report 2016-2024, has been prepared based on an in-depth market analysis from industry experts. 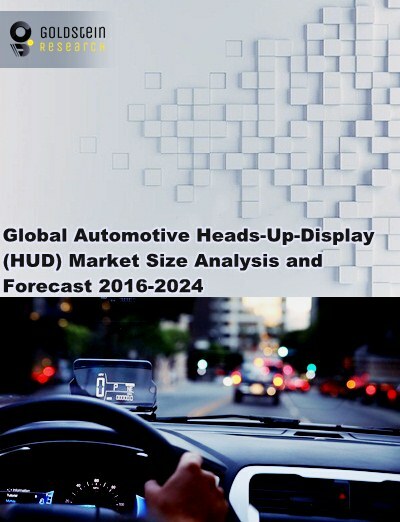 The report covers the competitive landscape and current position of major players in the global automotive HUD market. The report also includes porter’s five force model, SWOT analysis, company profiling, business strategies of market players and their business models. Automotive HUD market report also recognizes value chain analysis to understand the cost differentiation to provide competitive advantage to the existing and new entry players. Our automotive HUD market report comprises of the following companies as the key players in the global Automotive HUD market: Continental Automotive, Delphi Automotive, Denso, Nippon Seiki, Panasonic Automotive System, Robert Bosch and Visteon. On the basis of vehicle type, passenger vehicles dominated the automotive HUD market with more than 80% market share in 2016. The segment is projected to remain dominant over the forecast period, with CAGR of 32.4% over the forecast period. Geographically, North America region dominated the global automotive HUD market, accounted for more than 40% revenue share in global automotive HUD market. Asia Pacific region is anticipated to be the fastest growing automotive HUD market, which is likely to expand at a CAGR of 25.6% over the forecast period. Asia Pacific region showcase immense growth opportunities owing to huge automobile production and sales in the region. According to our Automotive HUD market study on the basis of extensive primary and secondary research, one of the major trend that driving the growth of automotive HUD market is growing popularity of advanced infotainment systems. The use of HUD in automobiles was considered as a luxury spec reserved for high-end luxury cars. Today, however, rapid technological development in automotive infotainment system and navigation systems has made a HUD a center of attraction in most automotive designs. According to the report, major driver in global automotive HUD market is technological advancement in automotive HUDs. Recent advancement in automotive HUD technology has improved the designs of HUD systems, with new technologies such as LCS and LED technology to convey better image and are less expensive to manufacture. Moreover, augment reality technology is also being used in these devices which is likely impel the automotive head up display market growth in coming years. Further, the report states that one challenge in global Automotive HUD market is cutting cost and downsizing of technology for mass consumers. Automotive HUD displays are majorly provided by the some major automotive OEMs in their high-end variant of vehicles, as these HUD systems are still costly and can be afforded by the luxury car customers. What is the total sales 2015-16 (Unit) and what would be the expected demand of Automotive HUD over the forecast period?